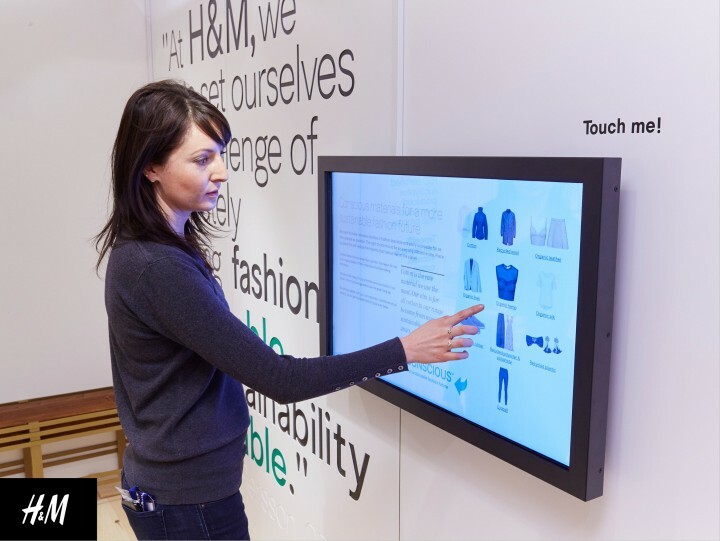 Form room have created a stylish activation area on the fourth floor H&M’s Flagship store on Oxford Street. It is a reactivation of H&M’s conscious brand message; reminding the customers of their ‘closed loop’ ethos creating sustainable and environmentally conscious fashion. The space is minimal using a small palette of colours and finishes, focusing on interaction and media to aid portraying the brand message. 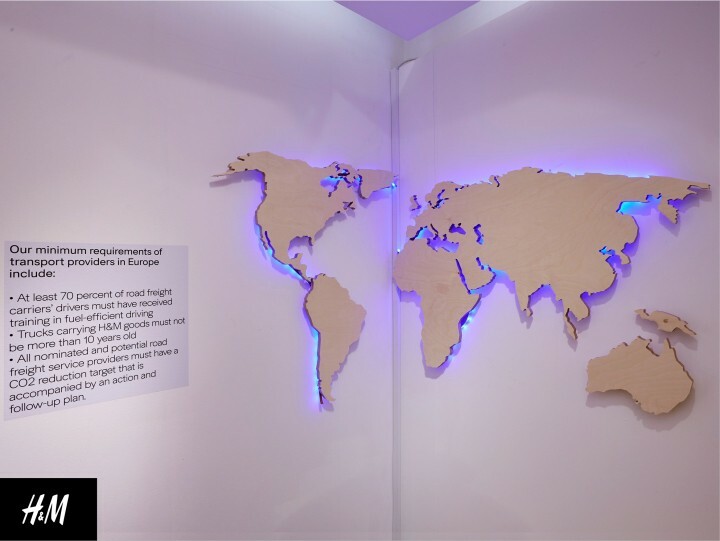 A simple floor vinyl is used to illustrate the closed loop path for customers to follow, navigation them to different touchpoints including an illuminated world map to portray the transport message. From touch screens to a video wall to a live social media feed, customers are encourages to interact with the brand to learn about their values. 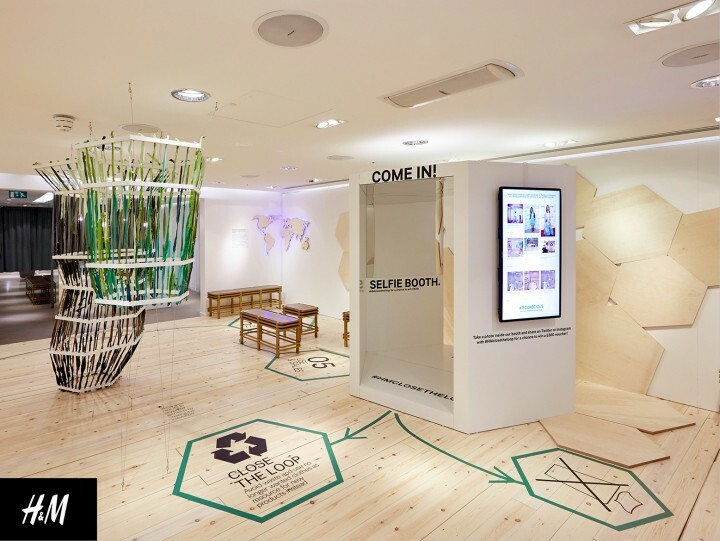 A bespoke ‘selfie booth’ has been designed for customers to take pictures and share on social media tagged with #Hmclosetheloop for them to have a chance at winning a prize. Clothes are suspended from simple frames and ripped up unwanted garments are threaded into hexagonal mounts to create an impactful central installation. For competitive fashion brands, differentiating themselves is more important than ever; with customer experience becoming the essential tool in retail design, technology and interaction are key. Additionally, a brand showing the customer how they have strong brand ethics and attention to environmental challenges creates a stronger emotional connection between the customer and the brand, and is something that often influences purchases today. H&M have addressed these key evolving retail principles in order to create brand extension and to show that they are more than just a high street fashion brand.